Welcome! I am so glad that you've stopped by! Hi! I'm Jessica and WELCOME to "My Teacher's Name is Mama." 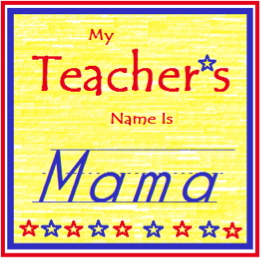 I am a mama to three wonderful children and have been a classroom teacher for 10+ years! Here you will find ideas and activities to help you be your child's FIRST and FOREVER teacher. Whether you homeschool or send your child to school I hope to encourage you to be your child's best teacher! To the left you will see the most popular post on my blog. You may find it helpful to use the search bar, labels, or archive (found on the left sidebar) to begin reading a topic of interest! Or click HERE to see the most recent post. Looking for a new curriculum, product, or book? Check out all my product reviews and recommendations HERE! Stay updated on all new information and helpful post's by subscribing your email below! Thanks for joining!